Bassel al-Assad International Airport (Arabic: مطار باسل الأسد الدولي‎) (IATA: LTK, ICAO: OSLK) is an airport serving Latakia, the principal port city of Syria. 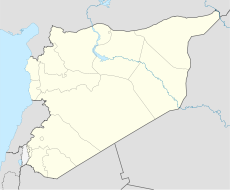 The airport is named for Bassel al-Assad (1962–1994), son of the late Syrian President Hafez al-Assad and brother of the current President Bashar al-Assad. The airport resides at an elevation of 157 feet (48 m) above mean sea level. It has one runway designated 17/35 with an asphalt surface measuring 2,797 by 45 metres (9,177 × 148 ft).